Tears for Tiers ← You Want Me To Wear What? The dress’s name is so close to accurate. Because, looking at this dress, I can’t help but feel like the dress is crying for what could have been. If this dress didn’t have these excessive tiers, I might actually have liked this dress. The shape of the bodice is nice in a vintage prom dress way, and the color kind of works for me. But no. There are those damn tiers. And I think the dress knows that those tiers mar its elegance. I think it knows, and at night, when no one’s looking, it cries. 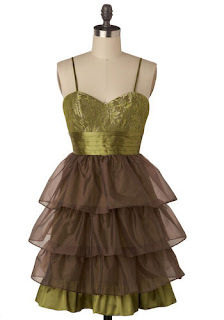 So, an apt name, ModCloth, but a cruel twist of fate for the dress.